The Connect With Your Deck Challenge is a Tarot challenge with a new theme every month. We will follow a new set of prompts and use our favourite Tarot or Oracle deck to answer the questions each month. My hope is that through daily journaling and reflecting on your cards it will help you form a connection with your deck. The challenge prompts/questions are completely open to interpretation. Each month I will post a new challenge graphic here on the blog, on Instagram and on Facebook. This graphic will contain daily questions you can use to guide your Tarot, Oracle or Lenormand deck reading. Follow me @eroebuckjones to be sure you don’t miss the monthly prompts. Search the hashtag #ConnectWithYourDeckChallenge and engage with others by liking commenting and asking questions. Did you know you can also follow hashtags? 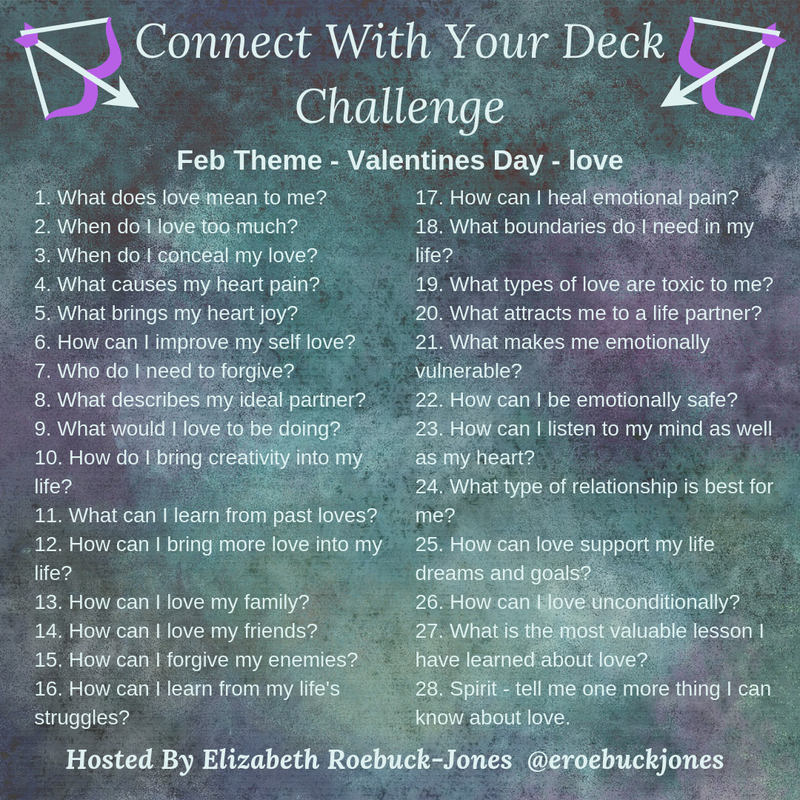 if you follow #ConnectWithYourDeckChallenge the posts from the challenge will appear in your feed and help to keep up to date on all the fun! When you join the Facebook group check out the Photograph section (left on the left hand side of the group menu) to see the current months album. Each photo in the album corresponds to a particular day of the month. To keep things organised we ask that you post your photos and responses in the comment section of the corresponding days photo. Learn from each other by liking commenting and asking questions. This electronic PDF download journal will give you the tools you need to stay on track with the challenge. So many of you have told me you find it difficult to stay on track and keep up with daily Tarot practice. The worksheets in this journal are going to help you stay focussed and connected. you can use the Rider Waite Smith Tarot OR a deck of your choice for the challenge – it is up to you!